There is no better way to accompany your beautiful Black Clay Pots than with this Kcool exclusively designed Black Clay La Chamba Salt Pig. If you’ve never used one, once you do, you will never be able to live without one. The salt stays fresh and convenient for when you need a pinch, grabbing exactly the amount you need. As with all La Chamba products, it will be a beautiful, one-of-a-kind accessory on your cooktop or stove. 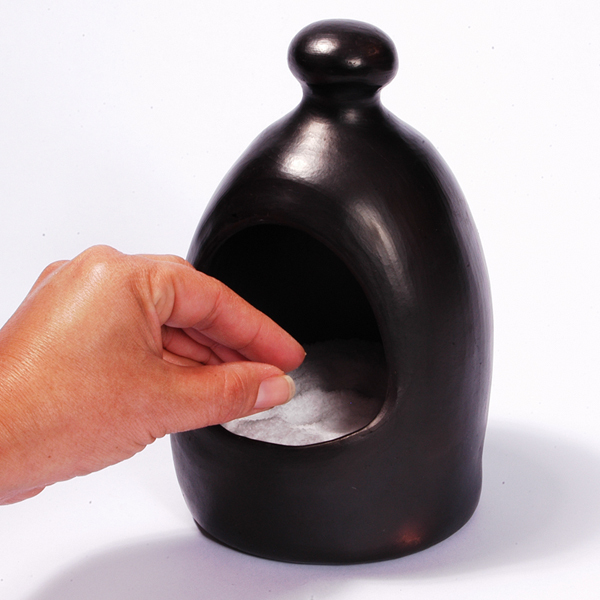 This salt pig has good capacity & the opening is big enough for larger hands. This unit was a replacement for a nice Emile Henry that I needed a small spoon to get anything out of. Unit stands just over 7" tall & the base diameter is slightly over 5". Beautiful and authentic appearing natural clay salt pig. It is just what I wanted.